When you write a lot of Python code in a project, or accross project, you will often want to make reusable parts of code. In each project, you can write Python modules in the Library editor. The project’s library editor is available by going into the “Code” universe (orange), and selecting the “Libraries” tab. You can then write code under a “Python source” folder, i.e. a folder that has the “Python” icon associated to it. Modules that are written here are automatically available in all Python code in the same project. Import rules are the regular Python rules. By default, the Library editor contains two top-level folders, “python” and “R”, which are respectively the root folder for Python and R code. You can create other folders that will also act as Python source folders, i.e. that will be added to the PYTHONPATH (or sys.path) of the Python processes of the project. Working with multiple source folders is mainly useful when importing code from external Git repositories. When using this, addition of the new folders is automatic. To manually edit the list and order of the Python source folders, open the external-libraries.json file in the library editor and edit the pythonPath list. All pathes must be relative to the root of the library editor. If you have created libraries in a project A, you can import them in project B. The libraries of project A will be added to the source path of all code running in project B. You need to have “Read project content” permission on A and “write project content” on B. In addition to the per-project Python library editor, there is another global Python library editor for the whole instance. 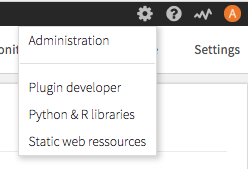 The global Python library editor is available from the “Settings” menu. Putting code in the global library increases the risk of having clashes or conflict. Generally speaking, it is preferable to use per-project libraries. Libraries in the global folder will be importable in all Python code, regardless of the active code environment. You might need to ensure that your code is compatible with both Python 2 and Python 3.